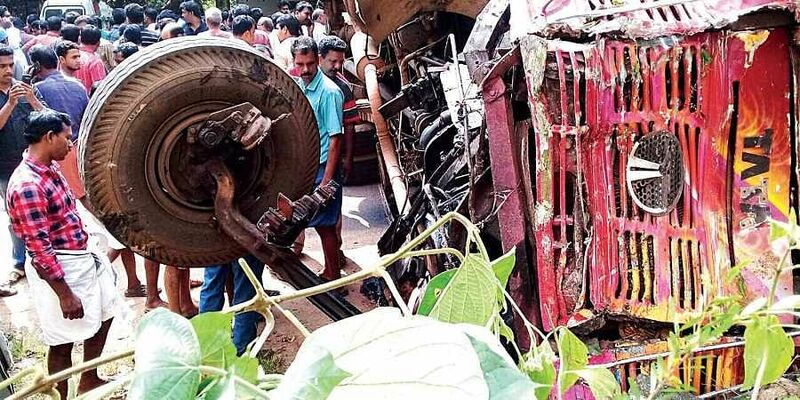 A head-on collision between a KSRTC bus and a lorry, left two dead and several injured at Ithikara in Kollam on Monday morning. KOLLAM: A head-on collision between a KSRTC bus and a lorry, left two dead and several injured at Ithikara in Kollam on Monday morning. The bus conductor, PT Subash and lorry driver Ganeshan died in the tragic incident. The incident happened around 6.50 am on Ithikara bridge, 11 kilometers away from Kollam city. The Thiruvananthapuram -bound deluxe bus coming from Mananthavady collided with the lorry heading towards Chamakada market in Kollam. Ten people were injured and were admitted in private hospitals at Kottiyam. The conductor died on the spot. It took one-and-half-hours to find the body of the lorry driver from the wreck. The condition of the KSRTC driver Abdul Aziz, is said to be serious. Following the accident, traffic along the National Highway was affected for more than two hours and it has since been restored. Transport Minister AK Saseendran, Fisheries Minister J Mercykutty Amma, KSRTC CMD Tomin J Thachankary have visited the accident victims at hospitals.